RIVERSIDE (California) - Police arrested a woman for observing a checkpoint Friday evening. The community responded in protest, occupying the area in front of Robert Presley Detention Center overnight, marching, and demanding the release of our comrade. The woman was released to the hospital at approximately eight o'clock Saturday morning, despite having suffered an epileptic seizure some nine hours earlier. Friday turned out to be a long day for many occupiers and their allies. Some had attended the Labor Studies Conference at UCR, and quite a number were also at the Bank of America protest in the afternoon. Even those who weren't were at the earlier events had planned on attending a nuclear power-themed general assembly and a strategies session. But plans changed when activists spotted the downtown police roadblock on northbound Market Avenue. Immediately, people showed up with signs to warn approaching drivers and cameras to document any abuses or police incidents. The operation's commander was notified that observation and documentation was going to be taking place at a distance. Monitors stood on the sidewalk in between the street where the checkpoint was taking place in and the parking lot that served as both staging area and secondary inspection area. Northbound motorists in both lanes were stopped and demanded their driver's licenses. Some were asked if they had had anything to drink. Many were directed into the parking lot, where many families were removed from vehicles and numerous vehicles were towed. At about 7:30, an officer approached the group of about six copwatchers, one of whom was filming, and ordered them to leave. The man who was filming asked if he was breaking a law, and if so, which one. The officer responded that it was a matter of officer safety and that he couldn't conduct the checkpoint and "keep an eye on" the activists at the same time. When the man repeated the question, the officer said that he wasn't gonig to answer any more questions, and that if the group did not remove itself in five seconds, they would be arrested. He called for backup and started moving in on the man, who backed up quickly, and the group began to leave. One of the group, a 22-year old woman and a student at Riverside Community College, was arrested. The activists were unnerved and at that point the observation action turned into a protest of the arrest. Over the next two hours, numerous supporters arrived to the location to join the protest. A meeting was called and a decision made to wait outside the jail and protest the arrest. When it became clear that she would not be out until the morning, we retrieved our pillows and blankets and set up camp for the night. The area was scrawled with chalked messages of and solidarity and others that read "ftp." Signs were placed in the trees and on walls surrounding the detention center. 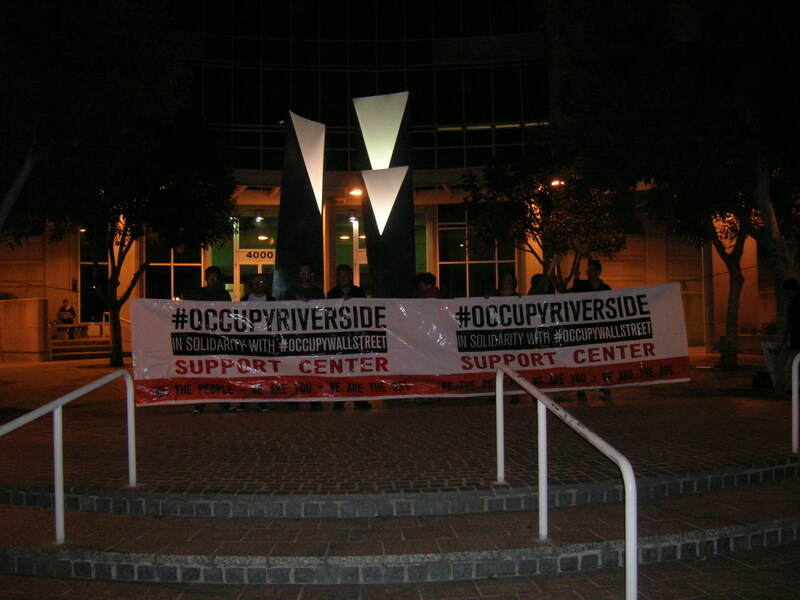 The Occupy Riverside banner was placed on the steps of the detention center, and when deputies ordered its removal, an even larger one was tied it between two trees in front of the sheriff's door. This, too, was ordered down, under allegations that it was a safety hazard because "someone might not see" the 20-foot banner. Unfazed, the occupiers tied the banner between the poles holding the city streetlights. As people exited the jail, they were surprised to see the number of people but were encouraged that we were out there. They were not surprised to learn of the injustice committed by the police, and several shared stories of abuse by police and sheriffs in the detention center. Many also joined us, opting to show their solidarity for our sister and with our efforts against the system. To pass the time, we chanted, sang, and read together. We took time to get to know the new people who had joined us. We made signs and banners. We ate and drank coffee and smoked cigarettes. At about seven in the morning, we saw an ambulance pull into the back of the jail. Concerned for the safety of our friend and aware of her medical condition, we rushed inside, only to learn that the desk clerk had no information. Two hours later, an official came out and informed us that the accused had been transferred to the county hospital in Moreno Valley. We rushed over there and were eventually able to visit her. She was discharged at about noon. Once we were able to speak to hear, we learned what had happened. Authorities had attempted to pump her for information, but were thwarted when she asserted her right to not speak. They made snide comments about Occupy and the protest. They needlessly seized her footwear. They ignored her cries for help when she tried to alert them to her feeling the seizure coming on, mocking her instead. Hours later, once she woke, they did not acknowledge the episode, just asked if she was cold but did not provide any blanket after an affirmative response. It was only after the second seizure, at about six in the morning, that medical attention was provided and she was transported, still in chains, to the hospital. The general assembly that night was particularly well-attended, with the many new and relapsed occupiers in attendance joined by released detainees, visitors from Sacramento and San Diego occupys, and passersby. Right after GA a militant march took place that immediately took the streets, blocking traffic and parading discontent throughout the downtown area. As it descended on the jail, three police squad cars arrived but were confronted by the angry group that asserted its right to protest. The march stopped by the police station before joining in a group hug in the middle of the street, and then spreading the word to the elderly crowd then exiting the Fox Theater. As we returned to People's Plaza, we passed police chief Sergio Diaz, dressed in civilian clothes and chomping a cigar, who glared angrily as we passed by chanting "No justice, no peace! No racist police!" Ever since May first, Occupy Riverside has been in an existential crisis, wondering which way it would go in the future. But this incident reminded us that what we will do, we have done already: Form community that supports each other, feed the hungry, stand with homeowners against the banks, defend education and educate one another, take back public space and use it for democracy, and provide an alternative political body as a refuge from the 1%-dominated spheres.